Constitution Day in Andorra is annually celebrated on March 14. 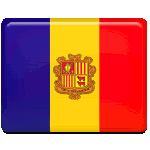 Current Constitution of Andorra was adopted on February 2, 1993 and given assent by the Andorrans on March 14. The document, that was adopted in 1934 by Boris I, is considered as the first constitution of Andorra. Russian emigrant Boris Skossyreff declared himself Boris I, King of Andorra, later he was arrested and expelled. Although Boris I ruled the country for a one week and a half, he managed to sign several documents and enact a constitution. Constitution Day in Andorra is connected to the day, when modern constitution was adopted on February 2, 1993 and approved by the Andorrans in a referendum on March 14. It came into force only on April 28, when it was published in the Butlletí Oficial del Principat d'Andorra. The Constitution of Andorra consists of 107 articles, divided into 9 chapters. It approves parliamentary system headed by the Prime Minister. The first general elections were held right after the adoption of a new constitution.